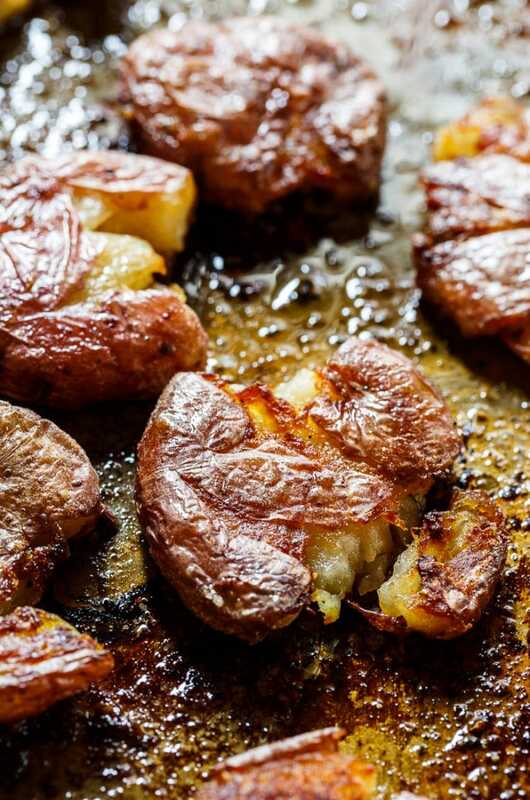 Meet the most delicious Roasted Salt and Vinegar Potatoes ever. They are so smooth and creamy on the inside, but perfectly crisp and even a little crunchy on the outside. They have a little tang from malt vinegar and just the right amount of saltiness. 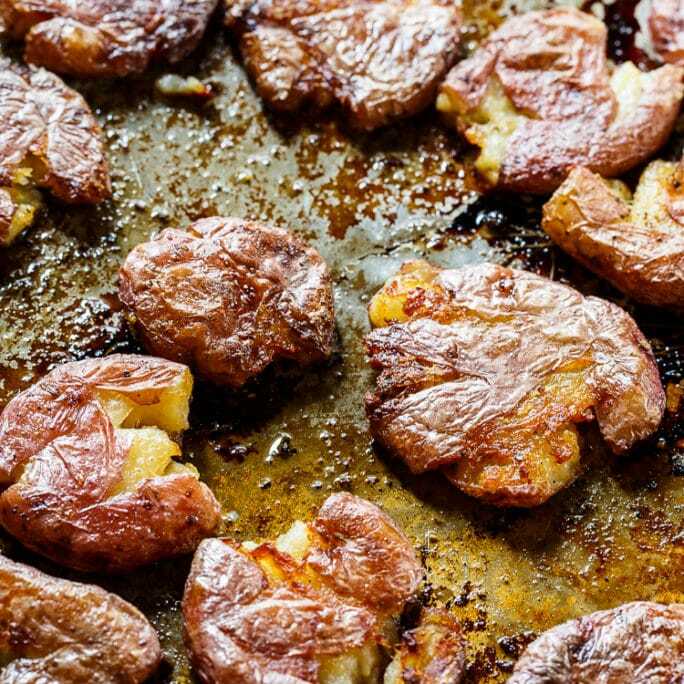 What’s perfect about these Roasted Salt and Vinegar Potatoes is the salt flavors the entire potato, not just the exterior. The potatoes are first boiled in HIGHLY salted water.I’m talking one and a quarter cups of salt mixed with two quarts of water saltiness. I know that seems like a crazy amount of salt, but trust me and the people at Cook’s Country who came up with this recipe. It is just the right amount. 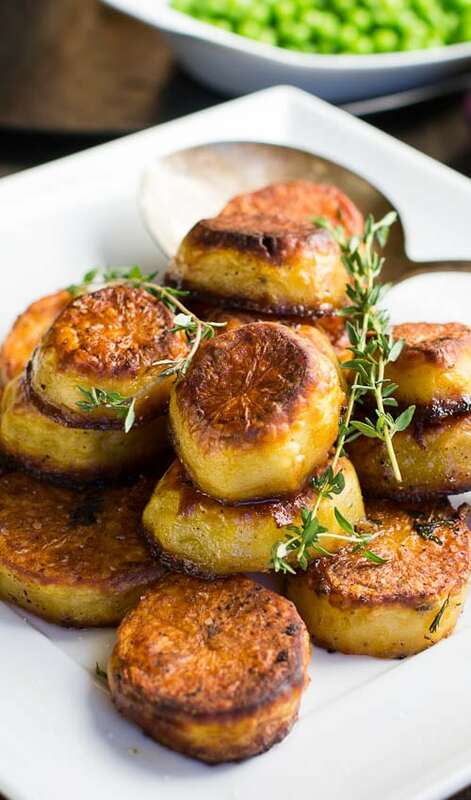 After they are boiled until tender, the potatoes are set on a rack to air dry and then placed on a baking sheet that has been liberally coated with olive oil. They are then smashed, brushed with malt vinegar, seasoned with pepper and placed in a 500 degree oven for about 25 minutes. They are so delicious you will want to eat every last one of them right off the baking sheet. Enjoy!!! Place oven rack in upper-middle position. Heat oven to 500 degrees. Set wire rack in a rimmed baking sheet. Bring 2 quarts of water to a boil in a Dutch oven or large pot. Add potatoes and salt and cook until potatoes are just tender, about 20 to 30 minutes. Drain potatoes and place them on the wire rack to air dry for 10 minutes. Coat a baking sheet with the 6 tablespoons of olive oil. Place potatoes on greased baking sheet, spacing them evenly. Use the underside of a measuring cup to flatten each potato to 1/2-inch thickness. Brush potatoes with 1 1/2 tablespoons of the malt vinegar and season with pepper. 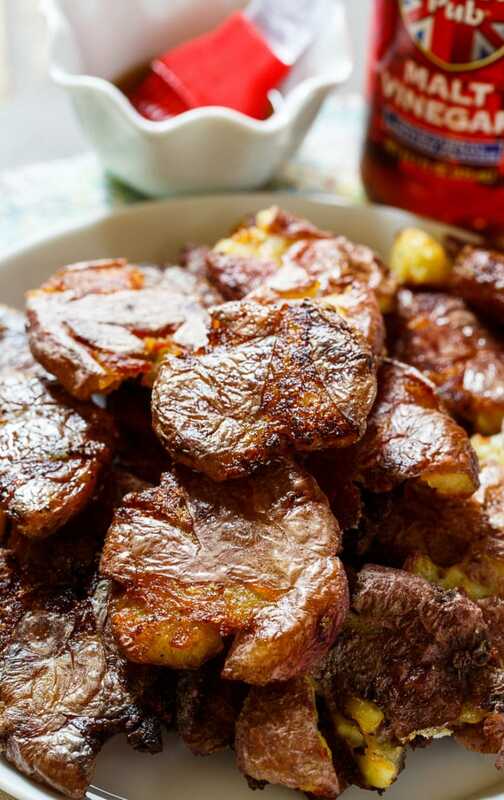 Roast until potatoes are browned, about 25 to 30 minutes. Brush with remaining vinegar and serve. Omg! 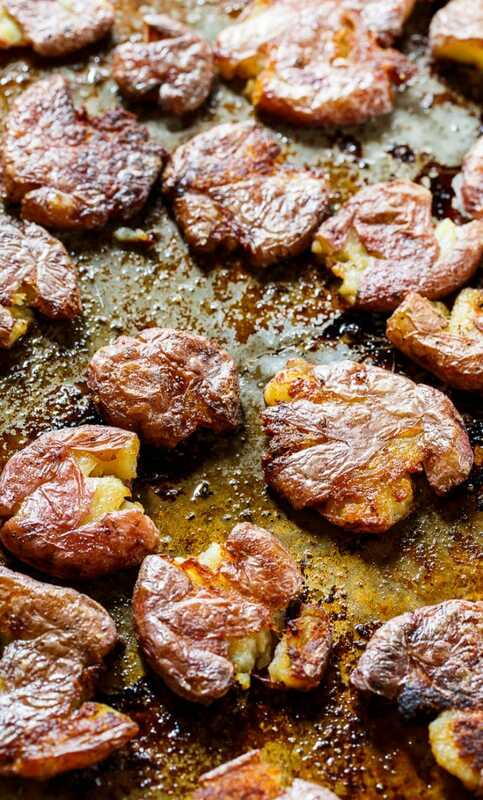 These are the best potatoes ever! I Love these. I don’t measure the salt though, just add until potatoes bob in the pot. Is that salt amount correct? That is an lot of salt. Yes, the salt amount is right. It does seem like too much salt, but the potatoes will be perfectly salted. and you don’t add any additional salt after you boil them. Never tried this; sounds interesting and will do this weekend ! Thank you !